Written by michi1506 on February 7, 2011 to Misc and Roxette. Per is doing a radio interview in Germany next week and the host of the show is interested in asking Per some more interesting questions directly from the fans and not that kind of stuff Per has already been asked 10,000 times. Post your questions as comments to this article. Written by tevensso on September 8, 2010 to Gyllene Tider, Misc and Roxette. Source: Harmonix. WORLDWIDE - Rock Band 3, the latest installation of Harmonix' huge hit series Rock Band will feature 1.5 Gessle songs!. 1.5? Yes, the full song is Roxette's "The Look," so grab your guitars, bass, drums, mic and for the first time ever; keyboards and rock the night away. So what's the second, half, song? Tom Petty's "I Need to Know" which was recorded by Gyllene Tider featuring Swedish lyrics written by Per Gessle. Gyllene Tider's version was released in 1981 and is called "Vill ha ett svar! "("I Want an Answer"). This is what Harmonix writes about the game: "Rock Band 3 doesn't just feature an amazing 83-song setlist. Its deep Career Mode takes the band on a journey to gain new levels of status while the environment around them changes from streets and subways to tour stops and venues. The game also features a streamlined experience, with easy drop-in and drop-out, easier no-fail accessibility and an all-new Party Shuffle letting you jump right into gameplay. Rock Band 3 also introduces Rock Band Pro, bridging the world of gaming and real musicianship through a suite of new instrument controllers, trainers and game play options that open the door to real-world guitar, bass, keyboard and drum skills. Rock Band 3 will be available October 26 in North America and October 29 in the rest of the world for the Xbox 360, PlayStation 3, Nintendo Wii, and Nintendo DS." Timur contributed to this article. Written by ditroia on August 21, 2010 to Misc and Per Gessle. Source: The Guardian. Guardian: "You're Swedish. Are you mates with that bloke from True Blood, ABBA, Roxette, and the Swedish Chef from The Muppets?" 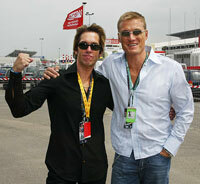 Lundgren: "I've met Skarsgård; we're doing something together. ABBA, I don't know. I know Per Gessle, he's a Ferrari fan. And I parted ways with the chef in a back room in New York with a baseball bat." Photo: Antti Puskala courtesy of Per Gessle. Written by roxtexanet on August 11, 2010 to Misc, Music Business and Roxette. DETROIT - WXYZ, a television station in Detroit, USA has teamed up with a local furniture store to offer up a $5,000 shopping spree (and bragging rights) in its annual "Art Van Cruisin' Idol" competition to the contestant who performs the best rendition of Roxette's "The Look." Ten lucky finalists were selected to record their version of Per and Marie's first US number one, and the four singers who receive the most votes will compete for viewers' votes during a televised broadcast that will air across North America on Aug. 21st. Check out some, uh, interesting interpretations of the Rox classic. Thanks to Jen Verwey for tracking this fantastic story down! Written by tevensso on July 13, 2010 to Misc and Per Gessle. The premiere copy has, among several interesting articles, also an interesting interview about art with Per Gessle, Lasse Nordin and Nette Johansson - the Tres Hombres - the art gallery at Hotell Tylösand. Written by colinvdbel on December 2, 2009 to Misc and Per Gessle. Source: Priscila Zaruvny Borges. CURITIBA, BRAZIL - Writer/director Marcos Marques from Curitiba, Brazil, wrote a screenplay based on the Son of a Plumber song "Are You An Old Hippie, Sir?". With his screenplay he won the 1st place at the Curitiba Cultural Foundation screenplay contest. As a prize he received $ 6,000 to make a movie based on this script. The short movie is titled "Você É Um Velho Hippie, Senhor?" in Portuguese and was shot November 1. It is currently in post-production. According to the movie producer, Priscila Zaruvny Borges (who kindly informed The Daily Roxette about this project), the story is about two guys at a convenience store and an old man that sometimes looks like an old hippie and sometimes like a serious business man. The two guys spend the movie trying to answer the "title" question. Look for the premiere at Curitiba's Cinemateca in June 2010! Written by colinvdbel on November 12, 2009 to Misc and Releases. Source: warmen.org. Finnish heavy metal band 'Warmen' recorded a cover of Roxette's "Fading Like A Flower". The song has been released as a bonus track on the Japanese version of their fourth studio album called "Japanese Hospitality". You can listen to the song on Warmen's Myspace page. Ettexor contributed to this article. Written by daniel_alv on July 7, 2009 to Misc. Written by tevensso on December 8, 2008 to Misc and Per Gessle.